National Water Quality Month is turning out rather dry in California, but trouble will soon be washing up in court. Farmers and business owners have filed more than 90 claims against the state government for causing a total of $1.7 billion in losses from the spillway failure at Oroville Dam back in February. Might they have a case? As we noted, the failure of the spillway prompted the evacuation of 200,000 people, hardly a frivolous move, because if the spillway collapsed it could have caused complete failure of the dam, built in 1968. One of the government’s first moves was to dam up the flow of information on safety issues. 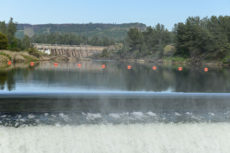 The governor and state water bureaucrats blocked public access to the dam’s design specifications, federal inspection reports, technical documents, and other crucial information. Department of Water Resources officials claimed it was a security matter, lest the information “fall into the wrong hands,” terrorists, for example. In typical style, politicians and bureaucrats are simply hiding years of negligence, faulty oversight, and misguided spending. The state will doubtless point the finger at Mother Nature, but more evidence may emerge in court that government is to blame. Any payout will heap more costs on California’s embattled taxpayers, now staring down the barrel of a $5.2 billion hike on gasoline, diesel fuel and vehicle fees.